Welcome to a new Squigglefly Challenge hosted this week by Carolyn's Crafters and the challenge is Snow Much Fun! Since we are in the season of snowy weather use snowmen, snowflakes, snowballs, design paper with snow on it or create your own snow. For my card I used Hipster Winter by Squigglefly artist, Sal Scheibe. So after you are done shoveling the snow outside, enjoy the warmth inside and join the snow challenge but be sure to us a Squigglefly image to be eligible to win! Stunning coloring on this unique hipster! I love her hat and glasses! Sensational card, Tammy! Here in Texas we saw the sun for the very first time in 2015 on Saturday. We are not used to this much cold and dreary weather. So cute! Wonderful coloring. I would have loved some snow this year, but our winter seems to be pretty much over - it will be almost 70 today! Cute, cute card! Fantastic coloring as always and love that big winter wishes sentiment! 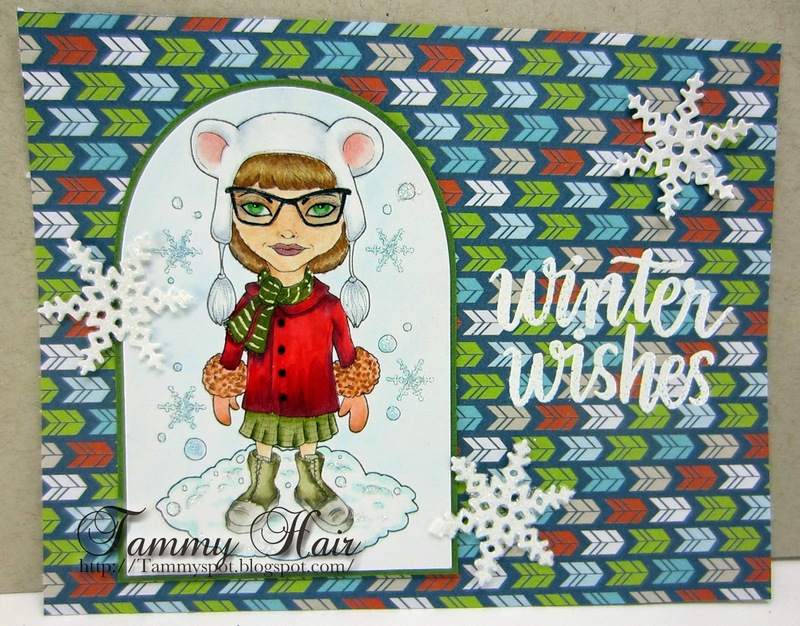 Beautiful colouring Tammy..great image and love the papers and snowflakes..
A super cute image. You have colored it beautifully and paired up the perfect paper to go with it. What a groovy card - lovely coloring and paper choice! This is gorgeous Tammy, I love the image and beautiful colours. Oh, she's hip, alright! She certainly has pretty green eyes! Very cute, Tammy! Awesome coloring of the image and fantastic design. Love her green eyes. What a darling card - and your coloring is wonderful! This is just adorable Tammy, great colors. Isn't she cute....your coloring is gorgeous and I looove those big green eyes!!!! I really like this image - great coloring!